When my 4 year old wanted a Gordon cake for his birthday I freaked! For anyone who doesn’t have a Thomas the Tank Engine fan, Gordon is one of the train characters. I NEVER wanted to do a character cake. 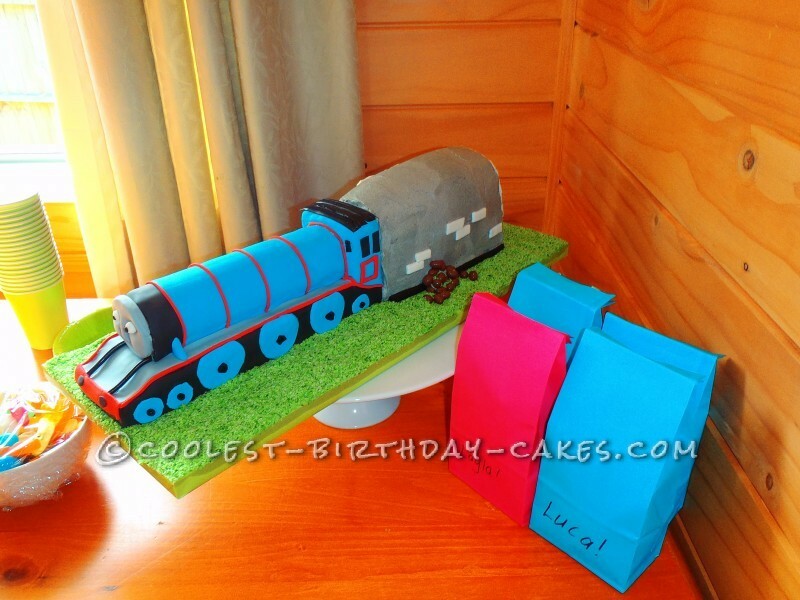 I have made a train, plane and fire engine cake in the past but they never were expected to look like anything. But as all good mothers do, I took my best shot. Everyone loved the cake and all the little 4 year old’s recognized it as Gordon! This to me was a sign of the greatest success! Specially since this was my fourth experience of cake making in my life! Before I begin I just want to say that I challenge myself to make 3 dimensional cakes. 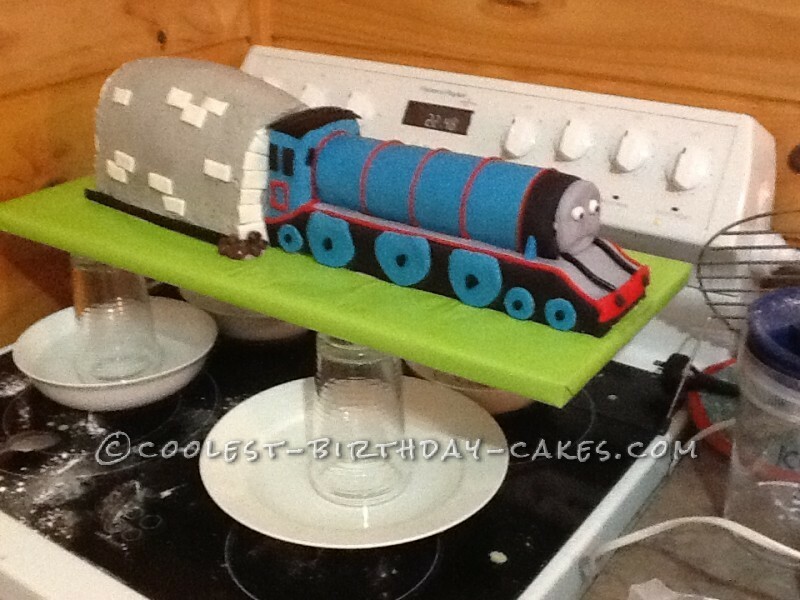 Therefore I wanted a Gordon that was upright and not placed on top of a basic cake. Where do all good cakes start? Google. I found a picture of a Gordon that I liked enough and attempted to recreate. Of course I found one on a professional cake site. I was doomed from the beginning- told myself it will never look like this! Aim High! Gordon was made out of honey rice bubble square ( rice krispie to others). I made three batches to get enough to make Gordon. I used two of these to make the rectangle shapes needed for his body. The other batch I stuffed into a cylinder shaped tube to make the round part of his body. EASIEST WAY EVER! I lined the tube with baking paper for easy removal. This is a MUST! The tube I used was 6cm wide and I cut it to 20cm long. I then used this as my proportions for the rest of Gordon. 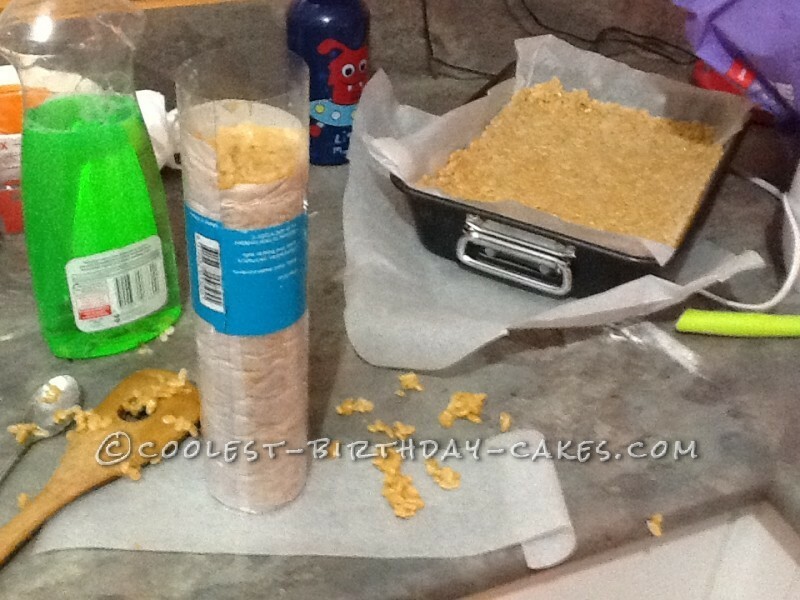 The rice cake was really easy to work with- I cut it with a bread knife to get straight edges. I then decorated Gordon using fondant. This was not as easy as I was hoping but I got there in the end. For Gordon’s face I searched YouTube and found a really good clip on making a Thomas face with fondant. Using the same principles I tried my hand at Gordon. This was probably the most disappointing part of the cake. It was much harder than it looked and I didn’t have much to go on. I was low on time so I waited till morning to see if my son approved it as a Gordon face and if he did then I would just accept it. I made two loaf cakes and a round cake. I cut the round cakes edges off an propped them on top to make the rounded arch shape (this may make no sense). used white fondant to make the bricks around the arch and some for the sides. Green colored coconut for the grass. chocolate raisins for the rocks. I put cups in bowls and place water in the bowls. 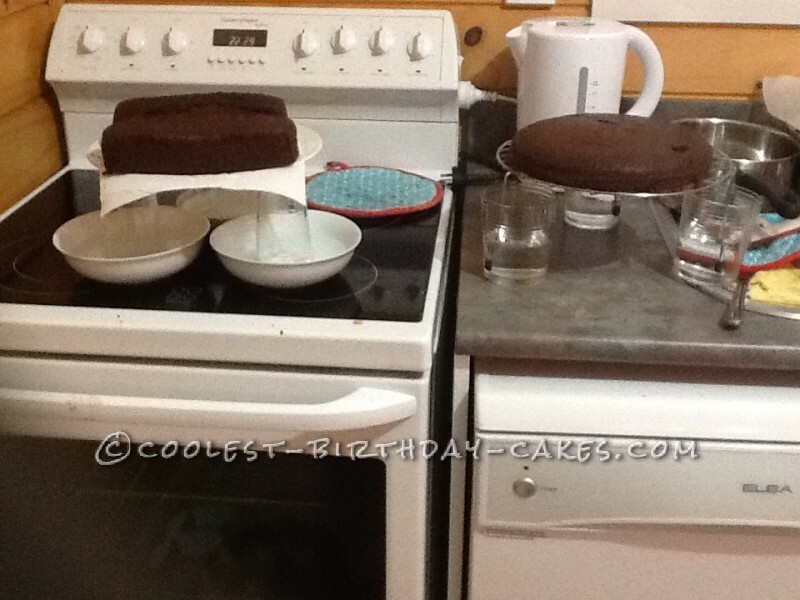 The cake then rests on the cups and NO ANTS can get to your cake removing the need to keep it covered. Overall this cake took in excess of 6 hours. I went to bed at the morning of the party. But the kids loved it! My son told everyone about it and all the party goers were very pleased. After the last three years the expectation for my cake was high from my family and friends. I am in no way a professional. I have in essence self-taught and I do not know what I’m really doing. But I like the challenge and I love to see the joy on my son’s face. I pride myself in making his birthday special and for putting in the effort to do so. So his cakes and his card are always made by myself . Birthday cake idea Posted by Olivia W.